The fifth ship in Princess Cruises' Royal Class will launch in June 2020. 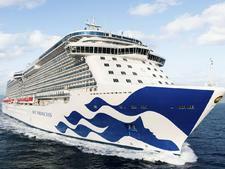 It will follow Royal Princess, Regal Princess, Majestic Princess and Sky Princess, which debuts in 2019. It will be named in Southampton, after which it will embark on a season of Mediterranean cruises. The 3,560-passenger Enchanted Princess will feature fleetwide staples such as the multistory Piazza atrium, adults-only Sanctuary and Movies Under the Stars concept, as well as a number of Royal-class features like the SeaWalk (a glass walkway that extends from the top deck) and Princess Live TV studio. Eighty percent of the ship's cabins will have balconies. Enchanted Princess will feature a new suite category called Sky Suites. Located at the top of the ship, the suites will feature 270-degree views, plus occupants will be able to watch the ship's Movies Under the Stars without leaving their room. Sky Suites will hold up to five people and offer the largest balconies in the Princess fleet -- 700 square feet. An all-new venue on Enchanted Princess will a standalone Salty Dog Gastropub, a rustic-styled pub where cruisers can catch a sporting event, while having a drink and some food, including the mouthwatering Ernesto Burger, created by Chef Ernesto Uchimura. Sabatini's on Enchanted Princess will be Trattoria style, featuring handmade past courses developed in collaboration with Los Angeles-based chef Angelo Auriana. Among the ship's other dining options will be the World Fresh Marketplace buffet and Crown Grill, the line's signature steakhouse. Bars will include the Wheelhouse Pub, which focuses on beer and whiskey, and Vines wine bar. As on Sky Princess, Enchanted Princess will have a cafe inside the Princess Live! studio, so people can enjoy a coffee or pastry while watching a live recording. Enchanted Princess will have a Wakeview pool at the back of the ship, and a redesigned Sanctuary with more private cabanas than on other ships.